Interior Door Pull Handles. Pair. To view parts or to place an order online is a simple and efficient process. You can search for a specific product in the search toolbar by typing the product name or OGTS part numbers that are identified in our printed and downloadable digital catalogs. * Please note: If you plan to place an order, you need to sign up. The Sign Up process quick & simple. Enter your email address and password, and you'll be able to sign into our online store, check your order status, and view your order history. We value your trust above all, so Opel GT Source will always keep your information safe and secure. After your submission, you will receive an E-mail confirmation with specific details about your order. We will contact you if there are any problems or to acquire about your billing information. For online orders, we will contact you for your payment information, as we do not accept credit card information online for security reasons. Please provide complete shipping and billing information. Please refer to business hours and telephone numbers. Methods of Payment We accept Paypal Payments, Visa, MasterCard, American Express, Discover, personal check, travelers check or Money Order. All payments must be made in U.S. dollars. COD shipments are not available. CASH Do not send cash, as we will not be responsible for any loss. CHECKS For personal checks, include area code, telephone number. If available, also include an e-mail address. SAME DAY SHIPMENT Phone your order in before 12:00 noon California time and it will be shipped the same day. (Based on if parts ordered are in stock). NEXT DAY AIR Need your parts tomorrow? Use UPS Next Day Air, for overnight delivery (M-F). Please call for a quote. Saturday delivery available for additional charge. SECOND DAY AIR If you are located east of the Mississippi, this service costs slightly more than ground service to your area and you will have your parts within two working days (M-F) rather than a week. If you are west of the Mississippi and want your parts no later than two days, this service is available. TREE DAY AIR Same as SECOND DAY AIR but in three working days (M-F). UPS GROUND Call for delivery times to your area. PRIORITY MAIL Typically two to three postal working days (Mon-Sat). HAWAII AND ALASKA UPS Air Service only or U.S. Priority Mail. CANADA UPS or U.S. Air Mail. PRICES All prices are subject to change without prior notice. However, we will notify you of any price increase before shipment. 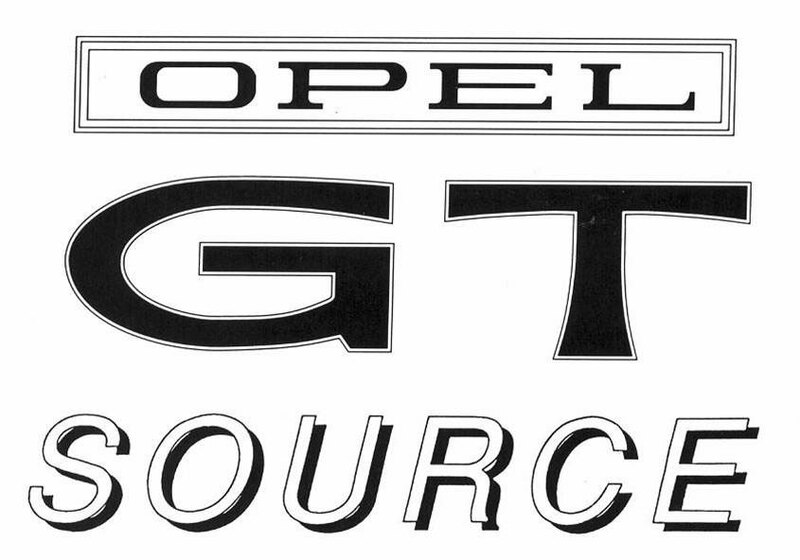 Opel GT Source reserves the right to correct typographical errors. DELIVERY UPS cannot deliver to a P.O. box, please have an address for us to ship to. Some products are too large to be shipped by UPS and a freight company will be used instead. SPECIAL ORDERS Special order items require a 50% deposit in advance. The deposit is non-refundable if you decide to cancel a special order while it is in transit or at our warehouse. Some LENK products must be shipped from Germany and require from 6-8 weeks for delivery to the U.S.